Do ghosts know they are dead? How Do Authors Choose Character Names? Should I put a swear word in my novel is a dilemma I encounter each time I sit down to write my books and short stories for fear of offending readers. Yet, how can I portray the realism of war. Soldiers swear and in battle this language is rife. For example, in The Grey Lady Ghost of the Cambridge Military Hospital, there was a Regiment of Scottish soldiers under attack in Afghanistan. If none of them swore during the ensuing battle, readers would have found this strange. 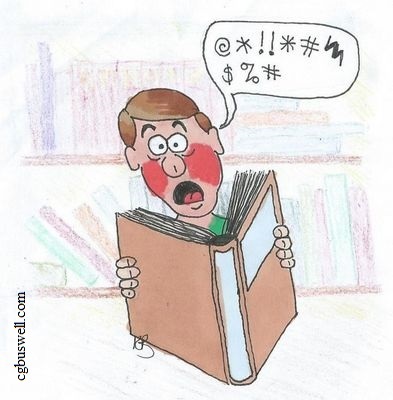 Sadly, due to my use of swearing in the novel, a local shop would not stock my books! Which I found sad, not least because folk in my village were asking where they could buy it locally out-with Amazon. I would not swear if I was writing children's books, but my novels and short stories are not aimed at readers under 18. So, get over it! People swear. Squaddies swear a lot! But do civilians? Of course they do. The author Tom Clancy sells books by the millions. His characters use naughty words. He, his agent, his publisher and his readers are mature enough to accept that this occurs in natural dialogue between people, especially in times of stress and action. Will the local shop prevent me using the F word again? No, in fact in a short story I am soon to release there will be the C word, which when readers delve into it and picture the character in their mind, they will wonder why he hasn't used it more often. There is the fear amongst authors that Amazon will not list their e-book on Kindle or paperback form. I personally don't think that this is a problem since one of their best sellers is a swear word adult colouring book! Will I make use of swearing in novels when I next sit down to write? @? *!ing right I will!